The Wednesday evening entertainments organised by the Bromley P.S.A. are becoming widely known and extremely popular, so much so that they almost deserve that initial designation which the organising body uses, and P.W.E. should become as well known as P.S.A. This week’s concert, a return visit from The Fragments, a clever concert party from St. Mary Cray, proved a great attraction and the hall was filled to overflowing long before the start of the programme. 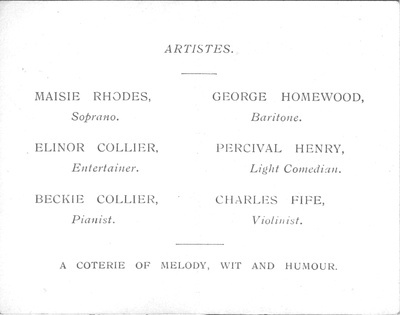 This cheerful quintet, consisting of the Misses Beckie and Elinor Collier, Maisie Rhodes and Messrs. George Grout and Percival Henry, provided two hours of music and humour, which kept the large audience constantly applauding and laughing. George Grout was pleasing in several songs, including “Mate of Mine” and “A Farewell” and Maisie Rhodes revealed a tuneful and pleasant voice in “Valley of Laughter,” “Mighty Lak a Rose” and “Piper of Love,” while the company gave several topical concerted numbers, including “Riding on a Camel” and “Give Yourself a pat on the back,” in the chorus of which the audience joined with a will. Humour was provided by Percival Henry and Elinor Collier, both of whom shewed a shrewd knowledge of the Cockney type of fun. Percival Henry was particularly good in “The Photo of the Girl I left behind” and in “Firstly, My Dear,” both of which went down well, while Miss Collier, in monologues like “If you knew Muvver” was greatly appreciated. Miss Beckie Collier, who acted as a capable accompanist throughout, gave a delightful pianoforte solo in “April Legend,” which she played with skill. The whole programme was well constructed and well balanced and was given with an air of evident enjoyment on the part of the performers, which quickly spread to the audience. An interesting ceremony took place during the afternoon, when the chairman, on behalf of the P.S.A., presented a gold-mounted fountain-pen to Mr. P. Collier, who has served the society for some years as hon. secretary, and said they wished to shew their appreciation of a worthy secretary. 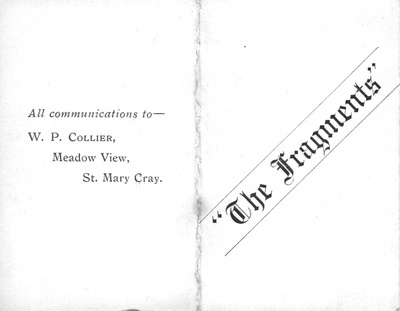 Mr. Collier, replying, said he considered it an honour to hold the position. ENJOYABLE EVENING AT ST. MARY CRAY. “The Fragments” Concert Party gave a fine show at St. Mary Cray Village Hall, on Saturday evening. Billie Morris’s songs provoked much laughter, and Jose Salmon (contralto) and Max Bragg (baritone), each contributed very tuneful items. Elinor Collier pleased the audience with her “Widow Twankey” monologues. Impressions of a coster boy in the gallery of a music hall were given by Percival Henry, and Charles Fife’s violin solos were very well received. Beckie Collier was the pianist and accompanist, and her solo, “Nocturne in Eb” (Chopin), was well played. The proceeds were in aid of the Village Community Council, and during the interval Mr. E. H. Joynson explained to the audience their aim, and on behalf of the council, thanked “The Fragments” for the excellent entertainment they had given. We are not concerned with the liberty of a few old men to mumble and blather in Parliamentary debate.—Sir Oswald Mosley. FRAGMENTS CONCERT PARTY AT ST. MARY CRAY. The members of the Fragments Concert Party gave a concert at St. Mary Cray Village Hall on Saturday evening, in aid of the funds of the Cray Wanderers Football Club. Billy Morris (the entertainer) caused merriment on numerous occasions during the evening, while Mr. Charles Fife’s violin solos were well received. Olive Benn’s and Max Bragg’s vocal efforts contributed to the enjoyment. Elinor Collier “put over” her monologues in her usual inimitable way, and Percival Collier carried out the duties of compère. Miss Beckie Collier was a hard working accompanist.